The executive board of the IOC which has been in dispute with AIBA, the world governing body of the the sport over their decision to elect controversial businessman Gafur Rakhimov – who has alleged links with organised crime in central Asia – as its new President. Significantly, though the IOC didn't shut the door completely on boxing. Essentially they kicked the issue down the road in the hope that under increasing pressure the AIBA will remove Rakhimov. However, judging by the mandate he received at the organisation's annual Congress in Moscow last month this seems unlikely. A committee chaired by IOC executive board member Nenad Lalovic will oversee an inquiry, which will determine whether the AIBA has made progress on the 'significant concerns' previously outlined by the IOC. Lalovic was credited with saving wrestling from being dropped as an Olympic sport prior to the last Olympics in Rio. According the the website Inside the Games while the outcome could lead to AIBA being suspended, IOC sports director Kit McConnell has claimed 'the goal was still to have an Olympic tournament in Tokyo 2020' and the IOC would do everything they can to ensure it took place. "Technical planning for the tournament remains ongoing behind the scenes,” said McConnell, even though boxing is the only Olympic sport whose qualification process has not been agreed yet ahead of the Tokyo Games. The inquiry is due to report its findings to the executive board prior to their meeting in Lausanne next June, just 15 months before the start of the Tokyo Games. The board has the power to put forward a recommendation but the full membership of the IOC will have the final say on the possible suspension of the AIBA. It's not clear whether this committee will examine the possibility of another organisation overseeing the qualification process and tournament itself in Tokyo. One of the world's professional governing bodies in the sport the World Boxing Association has expressed an interesting in doing this are in the process of establishing an office in Lausanne. But such a move is fraught with legal difficulties and would almost certainly end up in the courts. A decision to remove boxing from the Olympics would be a disaster from an Ireland perspective as it's Ireland most successful Olympic sport. Irish boxers have won 16 Olympics medals including two gold. 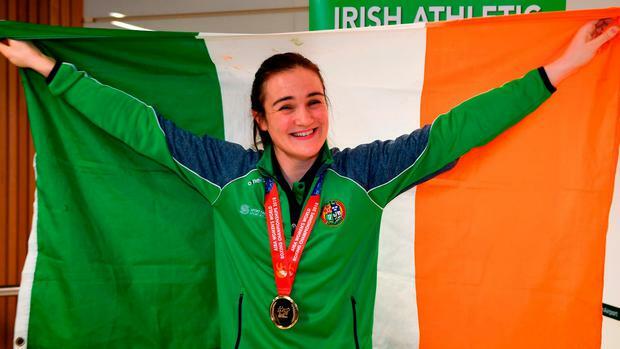 Last weekend at the World women's boxing championship in New Delhi Kellie Harrington was crowned World champion in the lightweight division and her ambition now is to repeat that achievement in Tokyo in 2020. But now her dream and that of the world's top amateur fighters could be dashed. Sport Ireland chief executive John Treacy has said that the organisation "deeply concerned, but not surprised," by today's IOC announcement. "When Gafur Rakhimov was elected as the President earlier this month, AIBA and the international boxing community would have been acutely aware of the IOC’s warning that the election of Mr Rakhimov as president would jeopardise boxing’s place on the programme for Tokyo 2020." Treacy added. “AIBA’s long-standing governance concerns and the issues that exist between AIBA and the IOC are of significant concern to Sport Ireland. The election of Mr Rakhimov is not the only governance issue of note within AIBA. “Sport Ireland will continue to monitor the situation and, in the meantime, work with the IABA to prepare Ireland’s boxers to the highest standards in the hope that a resolution is found to the current situation."